I tend to sum countries up by how they treat their archaeological sites and, in common with everyone I know, their airport security. On these grounds, Honduras, one of the world’s poorest countries, is a world-leader. 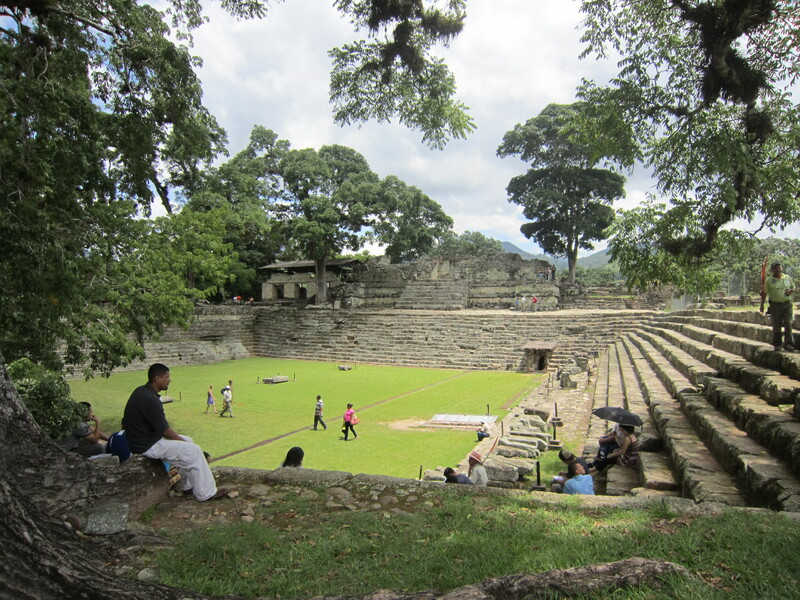 Its only World Heritage Site, inscribed in 1980, is the great Mayan capital of Copan, close to the Guatemalan border. Magnificently maintained and presented, this is quintessentially what a world class site should be – awe-inspiring archaeology in an unforgettable location. My visit was occasioned by a meeting to arrange an exhibition featuring the spectacular finds from the 1990s acropolis excavations to be mounted in the Penn Museum: Maya.2012: Lords of Time. This exhibition centres upon a reading of the Mayan calendar – hieroglyphs read by only a few experts – which some believe predicted the end of the world on the 23 December 2012. The Museum has adopted this anticipated catastrophe in order to add an apocalyptical overlay about how in recent times the Maya glyphs were cracked to tell a new tumultuous history of their kings and queens. The Terrible Tudors pale by comparison. Their own apocalypse, judging from these excavations, came suddenly in the so-called Late Classic, the 820s or so, when the dynasty fell suddenly, and Copan remained interred in a dark jungle until the redoubtable Frederick Catherwood and John Lloyd Stephens discovered it in 1845. From the pinnacle of the acropolis, clumps of this jungle run away to the east, but in truth this place has been sprung from the heart of darkness. Its grass lawns now covering the erstwhile white plastered plaza are worthy of a cricket ground, while glistening ageless saber trees with their web of roots grace the shoulders of the ruins like stately sculptures. Copan is essentially a monumental civic centre arranged around a great plaza and attached ballcourt, surrounded by the great compounds of its aristocrats. The acropolis on one side of the plaza is a pyramid that like a wedding cake grew incrementally with the vainglorious ambitions of each Copan king. Almost every king entombed the grandiosity of his predecessor, leaving the form and mausolea of his forebears buried beneath a palimpsest of superimposed stepped structures. Bordering the ballcourt is temple 26, dominated by the hieroglyphic stairway. The quintessential expression of jungle folly, it is exquisitely carved, the 1,250 glyph blocks telling the epic story of Copan’s kings, with the spirit of a stairway leading steeply upwards to the heavens. Only fifty years ago, a Penn researcher, Tatiana Proskouriakoff, played a critical part in cracking the glyph code. The stairway was started by Waxaklajun Ubaah K’awil (18 Rabbit), the 13th ruler who after a reign of 43 years was captured and executed on the 3 May AD 738 by the king of the neighbouring city of Quiriguá. After an uneasy interval it was completed by K’ak’ Yipyaj Chan Kawil l (Smoke Shell Squirrel) , the 15th ruler, in AD 755. Now conserved and carefully recorded by Barbara Fash from Harvard University, it belongs to those few iconic man-made wonders of the world from the sphinx to the Colosseum in Rome to the library of Celsius at Ephesus and in modern times, the Empire State building. 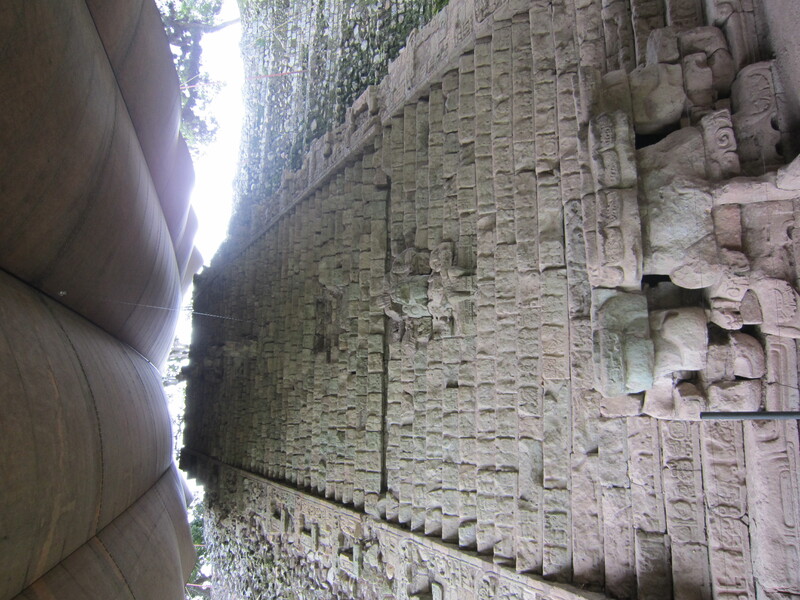 The plastic sculptures and glyphs of the stairway are not exceptional: Copan clearly celebrated its sculptors. Apart from the stele the size of Easter Island statues carved to patterns worthy of the Irish high crosses, there are countless elements, decorated stone blocks that once formed massive mosaic facades, worthy of the baroque era. The glyphs on the stairway tell of earlier kings, something that Mayan archaeologists hotly debated. Some believed the glyphs; some didn’t. This led to the 1990s Acropolis project to be featured in the Penn exhibition. The universities of Harvard, Pennsylvania and Tulane collaborated to penetrate the mass of the acropolis at different levels in search of earlier iterations of the pyramids and the tombs of their benefactor monarchs. Loa Traxler, who assisted Bob Sharer from Penn in excavating the earliest levels of the royal centre, was my guide in the Penn tunnel, starting midway up the east side of the acropolis. Closed to the public as yet, this person-sized passageway was burrowed along the visible lines of earlier terraces. The tunnel then twisted and turned around features belonging to an earlier temple until reaching a ruddy-colored plastered relief that betokened the façade of an earlier temple with glyphs that ascribe it to Ruler 2 and a date, AD 437. The excitement, Loa recalled, of discovering this was nothing compared to zig-zagging downwards into the vaulted chamber below, known as the Hunal Tomb. Breaking into it, Bob and Loa found the remains of an elderly man with notched and jade inlaid teeth, graced by a warrior’s headdress – a shell helmet – and accompanied by numerous objects including a deer effigy vessel containing cacao (chocolate). The man, they deduced, confounding the sceptics, was K’inch Yak K’uk’ Mo’ (Great-Sun First Quentzal Macaw) , the founding king of Copan from AD 426-37. The humidity here is intense, but Loa urged me onwards ever deeper into this temple. For her the prize discovery was another vaulted mausoleum known as the Margarita Tomb with unprecedented riches. On one side a step with a glyph mentions the first two rulers, but the body whose bones were painted with cinnabar was that of a great lady, almost certainly the wife of K’inich’ Yax K’uk’ Mo’. Her tomb was the most elaborate and richly furnished of any at Copan: multiple jade and shell necklaces, dozens of polychrome painted pots, mirrors, rings, and textiles. At a level above, Ricardo Agurcia, the founder and president of the Copan Foundation, former director of the Honduran Institute of Archaeology and key collaborator in the Acropolis project, proudly led me into his tunnels high above the Hunal and Margaritas tombs. Being tall, Ricardo’s tunnels are spacious, mined in for perhaps 30 metres, and then at different points these veered inwards to discover the so-called Rosalila Structure: a magnificent ornamented temple entirely entombed within the later pyramid. Dating to the mid 6th century, the entirely smooth plastered exterior is gorgeously painted with red ochre, some details being in bright green, yellow and orange. Ricardo’s team had to engineer a massive space to reveal its intricate cosmological glory. Like an illuminated manuscript, it conveys compelling messages, centering on K’inich Ahau, the Sun God and the spiritual founder of the Copan dynasty, K’inich Yax K’uk’ Mo’. Its second level dominated by burlesque masks of a monster pays tribute to the birthplace of maize. Winding around the darkened chambers, we arrived at the uppermost level where a smoking skull serves as an incense burner. This showy sacred monument is reconstructed in all its blazing colours as the centerpiece of the sculpture museum, created by Ricardo and his colleagues at the entrance to the park. Few excavations have made such a deep impression upon me: the skillful logic of the enquiry was rewarded with a peerless discovery, both majestic in form and accompanied by spectacular ritual objects. These great excavations, publicised by National Geographic in the 1990s, prompted the interest of thousands of tourists. About a hundred and forty thousand make the journey here each year. These numbers in turn helped the government’s Institute of Anthropology and the Copan Foundation to protect and present the archaeological site. The glades are meticulously maintained by a cohort of sixty or so workmen. Then, there is the added attraction of the scarlet macaws. Several flightless pairs of Honduras’s dazzling national bird have greeted visitors at the ticket office, begging tidbits like feisty cockerels. This July, though, the park carefully released five flying pairs into the woods. Like noisy fireworks, streaks of fiery blue and red, these birds unexpectedly appear from the high woodland canopies to thrill the audience in the plaza. More will soon be released to join the parrots in making a cacophony of jubilant song, eclipsing the paltry efforts of the site guides who hoot to illustrate the acoustic properties of the plaza. Mention too must be made of two other matters. Close by is the research centre where we held our meeting. This includes not only laboratories for the archaeologists but a warehouse for thousands of sculptures, amassed to make a corpus that includes the glyphs constituting a precious royal archive. Few sites worldwide dignify their collections so wonderfully well. No less impressive are the services of the little town of Copán Ruinas. Six thousand people live here, served by a flotilla of red tricycle taxis. These doggedly bump over the uneven cobbled streets, ferrying visitors to a whitewashed fortress on the hilltop housing an intelligently arranged children’s museum as well as to the twenty-eight estimable hotels and equally satisfying eateries including Twisted Tanya’s and Jim’s Pizza. Copan is the apogee of the World Heritage brand, a place that in essence is the metaphorical capital of Honduras. Thanks in particular to the assiduous efforts of the Copan Foundation, an Honduran NGO, nothing is tawdry about the experience here. Unesco could learn so much from the efforts of the local champions who have made the great history and archaeology of this place work to effect employment for those in the region. In this sense, the Maya have never died. Passing through security in San Pedro Sula airport, encountering the genial, bright-eyed staff, I had to pinch myself. Was this really airport security? This closing charm offensive not only endeared me to this country but made me instinctively reflect that they deserved the truly great World Heritage Site of Copan.